Centrally located on Karon’s stunning white sand beach, Mövenpick Residence Karon Beach Phuket is an idyllic place to find a second home in the sun. Conceived as an open living concept, each spacious residence comprises two bedrooms, bathrooms, a living, and kitchen and dining area in an airy contemporary design. The spacious verandah offers highly prized views over the Andaman Sea’s turquoise waters. Mövenpick Residence Karon Beach Phuket is strategically situated at the beachfront are of Mövenpick resort and Spa Karon Beach Phuket. The Apartment is gracefully integrated with the hotel’s extensive facilities, providing convenient access to restaurants, swimming pools, recreation facilities and spa. 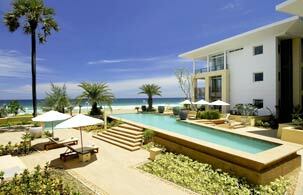 The apartment is now 100 % complete and to be managed by Mövenpick Resort and Spa Karon Beach Phuket. As part of the Mövenpick Group, Mövenpick Hotels and Resorts is an international Swiss premium hotel chain active in the 4 and 5 star resort and business hotels. Owners can be confident that their Apartments are in a very favorable position to generate significant rental income through the Hotel Rental Plan. Prices start from THB 14 million. For more information, please contact our Residential Sales Centre, located next to the hotel's Business Centre.